Boasting 36 outstanding golf holes, Royal Melbourne's 18-hole composite course is ranked No. 1 in Australia and No. 6 in the world. Designed by Dr Alister Mackenzie Royal Melbourne is a fine example of allowing the natural features of the land to dominate the layout. Venue of 16 Australian Opens, 3 World Cups, the 1998 President's Cup and a large number of important amateur and professional tournaments. Was the venue for the 2002 Heineken Classic. Ranked No. 2 in Australia behind Royal Melbourne's composite course, Kingston Heath is highly regarded as one of the country's finest 18 hole individual layouts. A true test of patience and skill, it has hosted several Australian and Victorian Opens and countless professional and amateur events. Laid out by Dan Souter in 1923, with bunkers redesigned three years later by Dr Alister Mackenzie. The Par 3, 15th hole is surrounded by some of the most intimidating and deep bunkers found anywhere in Australia. Completing Australia's top three ranked courses, Metropolitan's reputation as one of the best championship courses in Australia was further enhanced when it hosted the Australian Open in 1993 for the sixth time. A plethora of native trees line the pure Santa-Ana fairways. It was the venue for the 1997 Australian Open and the recent Accenture Match Play Championship in 2001. Host of the Australian Masters since 1979, Huntingdale is widely regarded as the best course in Australia not on the Australian Open roster. The greens are usually fast and true and of considerable size allowing often the chance of a long putt or two. Ranked No. 16 in Australia it is one of the youngest of the sandbelt. Five times British Open champion and Presidents' Cup team captain Peter Thompson, is one of the biggest fans. Home of the Australian Women's Open Championship, Yarra Yarra is yet another Dr Alister Mackenzie gems. The delight of this beautifully picturesque track starts with the drive to the clubhouse, winding through one of the loveliest arrivals to any Melbourne Golf Club. Like the rest of its sandbelt cousins, it features undulating terrain and a number of outstanding golf holes. Its four par threes collectively are almost unmatched for a variety and splendor anywhere in the nation. It is ranked No. 17 in Australia. Beckoning bunkers and trees wherever you look have become typical of Commonwealth. Don't be fooled, trees combined with attractive waterholes and strategically positioned bunkers, it's a never-ending series of challenges to all golfers. A credit to those involved without the aid of professional architects, the course as you see it today was molded by a former club captain and a secretary/manager who traveled extensively to the world's best courses. Commonwealth is ranked No. 14 in Australia. The host of the 1997 Victorian Open, Victoria is often described as one of the sandbelt's hidden gems. With tight fairways and heavily bunkered greens, Victoria calls on all of your course management skills. Visitors are always impressed with the magnificent tree- lined fairways and the holes are easily remembered after playing them. Ranked No. 6 in Australia. Surprisingly one of the few highly ranked courses that is unable to name its original architect. Situated on Victoria's scenic Mornington Peninsula, the 36-hole layout is built on a sandy tract of land a short distance from Frankston Beach. Both courses are gently undulating and boast picturesque tree lined fairways. The well bunkered couch fairways and bent greens provide a challenging game for all and sundry. The South course, ranked No. 21 in Australia is a Sloan Morpeth design built in 1969. The North can also be attributed to Sloan Morpeth, however is two years older than the South. 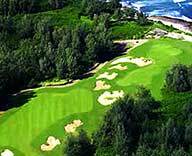 The greens are certain to be recognized as a highlight of any visit to Thirteenth Beach. Not only are the special Bent surfaces superb, but also the designers and constructors have resisted all temptation to create roller coaster ups and downs. Certainly there are wicked, deep bunkers about and there are impenetrable thickets of natural links rough. When the wind blows (which will be often) the generous fairway widths and large greens will shrink appreciably. The grand prize on Victoria's Bellarine Peninsula is Barwon Heads Golf Club. Barwon Heads, is a club that oozes class, where a certain decorum - not unlike Muirfield - must be maintained. Barwon Heads is famous in Australian golfing circles and is often referred to as a links. As with any course by the beach, of undulating sandy loam gets praised as such. The 3rd, 4th, 5th and 6th are authentically ‘links-like', but afterwards the tight coastal course winds back through wooded terrain. New South Wales is beautifully scenic with ocean views on all but 5 of the holes. Ranked #43 in the world, this championship course combines a great variety in the style of holes and is renowned for the four toughest finishing holes in Australia. Designed by Dr Alister MacKenzie, the course is situated on the rugged cliffs at La Perouse, and overlooks Botany Bay. Framed by the Pacific Ocean, many declare the course ‘presents more spectacular views than any other golf course in the world. Remodeled by Jack Nicklaus in the early 1980's the course is testing to say the least. The winds, which exist at The Lakes golf course, are also present here and the testing par 3's, brutally long par 4's and challenging par 5's make for an interesting round. The Australian is an extremely private golf club that boasts amongst its members Australia's richest man Kerry Packer. Another very private golf course that has hosted the Australian Open on a number of occasions is located in the posh eastern suburbs of Sydney. Royal Sydney Golf Club is very much a parkland style golf course with a clever combination of short and long par 4's as its main feature. The imposing clubhouse watches over the course and the 5,000 members enjoy the 18-hole championship golf course, the 9 hole executive course, numerous tennis courts and first class dining facilities. If you have the time head about 2 hours north of Sydney and play Newcastle Golf Club, a delightful course that has many overseas critics raving about how good it is. The layout is very interesting combining a series of well-matched holes into a testing round of 18 holes. In the world's top 100 golf course list, Newcastle achieved an honorable mention. To play on St Michael's golf course is a great experience. The majority of the course is covered by natural bush on both sides of its fairways. The Ocean breezes can also have a very big influence on your game, and therefore accurate straight driving is essential. The relaxed atmosphere while taking in the beautiful ocean views on the course will satisfy all visitors. It is a wonderful course, carved from a wilderness that will forever be a part of its charm and testing qualities. Host of the 2005 Australian Open. Ancient rolling sand dunes created "The Cups" region on the Mornington Peninsula. From the first hole, the golfer quickly realizes that this is no typical course, tucked tightly between natural barriers and designed within economics of scale. This course boasts mature stands of trees, roller coaster greens and bunkers in which you could easily hide a sport utility vehicle. The 18 hole "Open Course" at Moonah is a true links course. The Dunes is beautifully undulating, a true links in the Scottish and Irish traditions. The course winds through rolling valleys, hollows, hillocks and swales, and although there are just a few gentle hills, most greens and tees are in elevated positions so that a stout constitution is desirable. The Dunes has one solitary tree upon it, so man must battle with wind and the other elements in the true traditions of the game. There’s not a weak hole on the course. This course was dramatically crafted through the rugged coastal tea-tree and offers stunning ocean views on sixteen of the holes. These stirring views together with the constant battle against the harsh Cape Schanck elements define the experience according to designer Robert Trent Jones. The difficulty is the sharp bunkering, tiered landing areas and thick scrub surrounding the fairways, especially in all too frequent high winds. The rolling hills provide spectacular views across the bay. The superb couch fairways will never leave you with a bad lie, while the greens are fast and true - as good as any on the famed sandbelt courses. Thoughtful bunkering alongside both fairways and greens provides a real challenge for golfers. The links layout is most challenging when the wind blows, with many fairways lined with menacing tea tree that will swallow your ball if too errant off the tee.